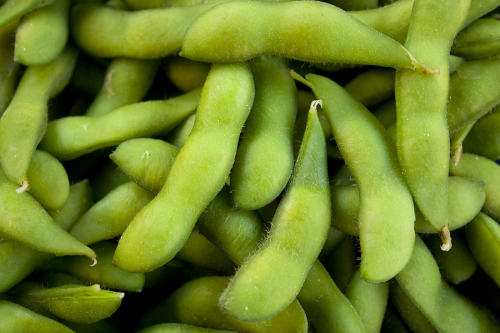 13/12/16 -- Soycomplex: Beans closed lower on news that the Chinese government had ordered six plants to temporarily halt crushing operations in order to curb air pollution. Argentina is said to be 58% planted, behind 64% normally, with more dry weather in the forecast. 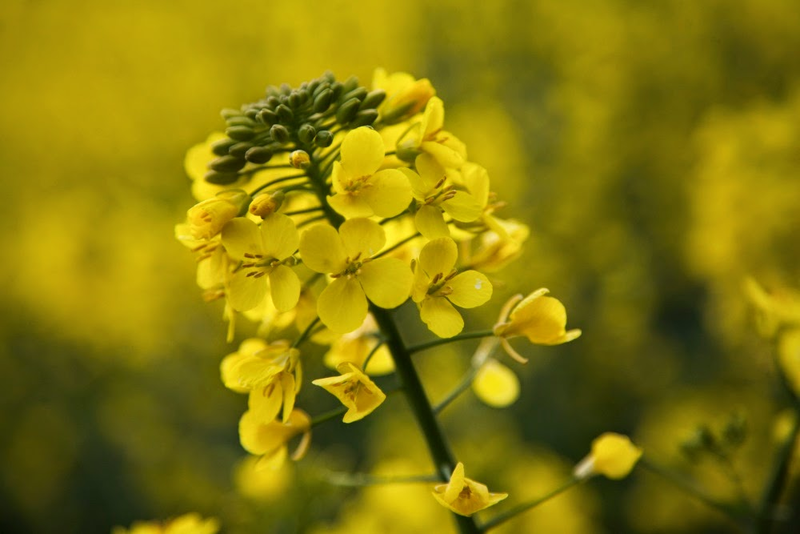 Coceral forecast the EU-28 2016 rapeseed crop at 20 MMT versus 22.4 MMT in 2015. IMEA say that growers in Brazil's Mato Grosso state are 47.5% forward sold versus 55.4% a year ago. There were no announcements from the USDA under the daily reporting system today. Jan 17 Soybeans settled at $10.28, down 3 cents; Mar 17 Soybeans settled at $10.39 1/2, down 3 cents; Dec 16 Soybean Meal settled at $313.50, down $1.30; Dec 16 Soybean Oil settled at 36.57, down 19 points. Corn: The market closed with small gains. Ethanol, which rose to two year highs yesterday, is keeping US demand solid. US production has been above 1 million barrels/day for the last six weeks. Ethanol cash margins are very attractive, averaging over $1/bu in the Midwest. The latest numbers from the US Energy Dept are out tomorrow. Argentina is said to be 48% planted on new crop corn. Some analysts are already starting to scale down their estimates for Argentine corn production this year. Coceral estimated EU-28 2016 corn output up 3.4% at 60.7 MMT. 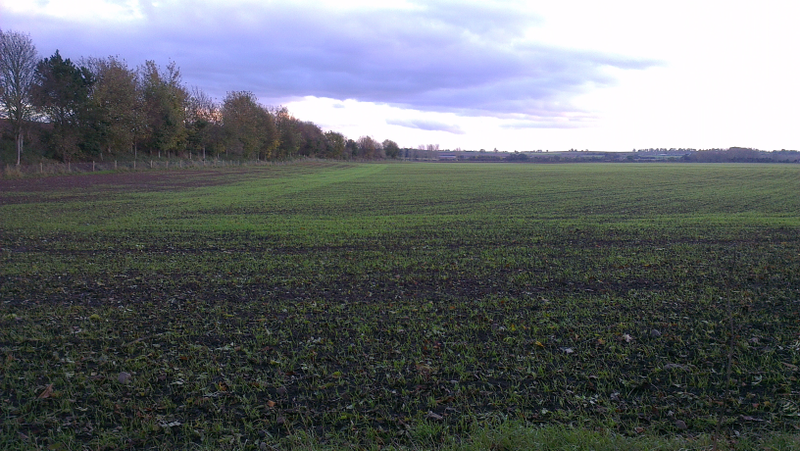 US growers are said to be "shutting up shop" ahead of adverse weather conditions rolling in and the Christmas break. Dec 16 Corn settled at $3.56 1/4, up 1 3/4 cents; Mar 17 Corn settled at $3.61, up 1/2 cent. Wheat: The wheat market closed mixed. Fresh news was limited. Coceral forecast the EU-28 soft wheat crop at 134.7 MMT, up slightly on their previous estimate but still 11.5% down on 152.1 MMT a year ago. Tunisia are tendering for 92,000 MT of soft wheat, and 50,000 MT of durum, and the Philippines tendered for 56,000 MT of feed wheat. Forecast cold weather for the US Plains is getting some attention from the shorts, with snow cover scarce in many places. Russia and Ukraine are also in for a cold snap that has Rusagrotrans lowering their estimate for Russia's grain exports this month from 3.8 MMT to 3.45 MMT. UkrAgroConsult trimmed the Russian barley crop 600 TMT to 18.4 MMT. Dec 16 CBOT Wheat settled at $3.98, down 3 1/4 cents; Dec 16 KCBT Wheat settled at $3.99 1/4, up 1 3/4 cents; Dec 16 MGEX Wheat settled at $5.40 3/4, down 1 cent. 13/12/16 -- EU grains closed mostly a touch firmer, save for London wheat which was a tad lower. The pound got a boost from news that UK inflation hit a two-year high of 1.2% in November, up from 0.9% in October. 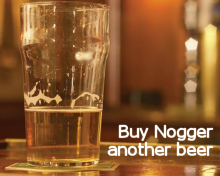 That adds a little bit of weight to the argument for the BoE to increase interest rates sooner rather than later. Hence sterling was firmer for much of the day. The day ended with Jan 17 London wheat down GBP0.10/tonne at GBP135.05/tonne, new front month Mar 17 Paris wheat was EUR1.00/tonne higher at EUR165.75/tonne, Jan 17 Paris corn was up EUR0.25/tonne to EUR165.25/tonne and Feb 17 Paris rapeseed rose EUR1.25/tonne to EUR414.25/tonne. UK export data for October shows that our wheat exports fell to 145,437 MT, down from 252,429 MT in September, with Algeria our largest single buyer taking 59,266 MT. Season to date exports are up 60% year-on-year at almost 859 TMT. UK October barley exports of 72 TMT were at their lowest level in four years, say the HGCA. Cumulative season to date exports are 430 TMT versus 507 TMT a year ago. "The slower pace of barley exports contrasts to the continued fastest pace of UK wheat exports for six years," they said. "UK average ex-farm feed barley spot prices traded over £20/MT lower than feed wheat in late October, yet wheat still continued to be more successful in finding both export and domestic feed demand. The spread between prices has continued to hover around £20/MT since, but if wheat continues to more successfully find demand relative to barley, there could be pressure for the spread to grow," they added. Coceral forecast the EU-28 soft wheat crop at 134.7 MMT, up slightly on their previous estimate but still 11.5% down on 152.1 MMT a year ago. 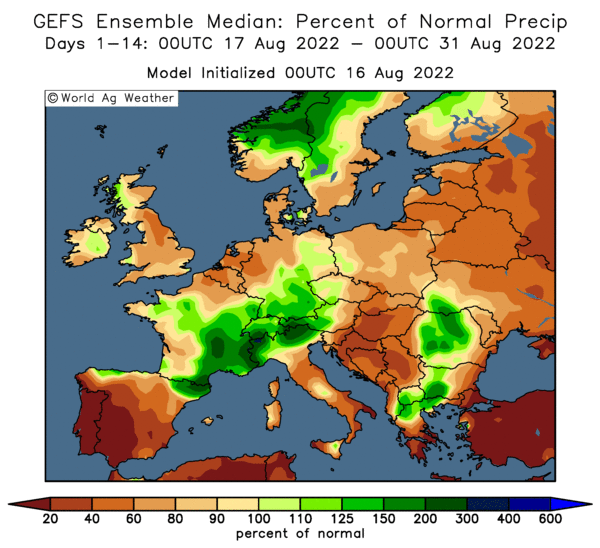 The French wheat crop was seen 31% lower than last year at 28.9 MMT, with output in the UK estimated 12% down at 14.5 MMT. 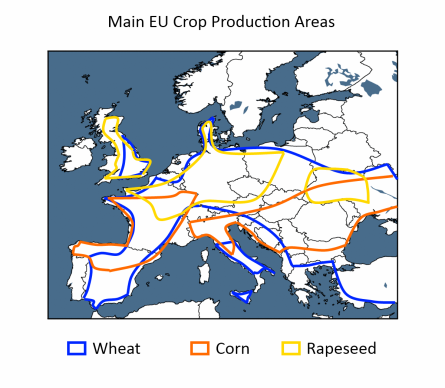 The EU barley crop was forecast 3.4% lower at 59.2 MMT, with corn output up 3.4% at 60.7 MMT. The French Ag Ministry estimated winter wheat plantings for the 2017 harvest around unchanged at 5.19 million ha, but some 3.5% up on the recent 5-year average. Rusagrotrans lowered their forecast for the country's December grain exports from 3.8 MMT to 3.45 MMT due to adverse weather conditions. 12/12/16 -- Soycomplex: Beans closed lower despite better than expected weekly export inspections of 1.837 MMT. The USDA also reported that China bought 256,600 MT of US soybeans for 2016/17 delivery under the daily reporting system. In Brazil, soybean planting is reported to be 95% complete. Jan 17 Soybeans settled at $10.31, down 6 1/2 cents; Mar 17 Soybeans settled at $10.42 1/2, down 6 cents; Dec 16 Soybean Meal settled at $314.80, down $2.60; Dec 16 Soybean Oil settled at 36.76, up 2 points. Corn: Corn closed a cent or two firmer. Weekly export inspections were 860,927 MT - more than 150% of the same week last year - but no better than trade expectations. China booked 100,000 MT of US sorghum according to the USDA's daily reporting system. The focus is now squarely on South American weather, with comined Arg/Braz production seen up 25-28% on last year. 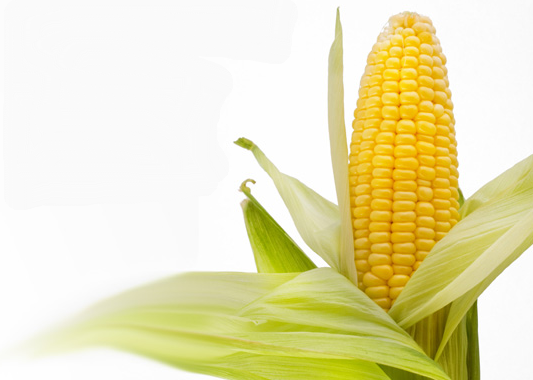 Ukraine seaports exported 429.9 TMT of corn last week, according to ASK Inform Agency. Russia's 2-16 corn harvest is seen 87.87% done at 14.9 MMT, according to their Ag Ministry. Dec 16 Corn settled at $3.54 1/2, up 2 cents; Mar 17 Corn settled at $3.60 1/2, up 1 cent. Wheat: Wheat closed modestly higher in all three exchanges. Weekly export inspections of 440,805 MT were in line with what was expected by the market. Saudi Arabia bought 725 000 MT of hard 12.5% milling wheat with at least some of it scheduled to come from the US, according to trade gossip. Algeria tendered for 100,000 MT of Jan milling wheat. Jordan are tendering for 25,000 MT of optional origin hard wheat. Russia said that it's 2016 wheat harvest was 98.2% complete at 75.9 MMT in bunker weight. Dec 16 CBOT Wheat settled at $4.01 1/4, up 1 cent; Dec 16 KCBT Wheat settled at $3.97 1/2, up 2 cents; Dec 16 MGEX Wheat settled at $5.41 3/4, up 5 3/4 cents. 12/12/16 -- EU grains closed mixed but mostly higher on the day, except expiring Dec 16 Paris wheat which was sharply lower in technical trade. At the finish Jan 17 London wheat was up GBP0.25/tonne at GBP135.15/tonne, Dec 16 Paris wheat plunged EUR6.25/tonne higher at EUR155.50/tonne, Jan 17 Paris corn ended EUR0.25/tonne firmer at EUR164.25/tonne and Feb 17 Paris rapeseed closed EUR1.00/tonne steadier at EUR413.00/tonne. Saudi Arabia bought 725 000 MT of hard 12.5% milling wheat, probably said to be a mixture of US and South American origin for shipment Feb/April. Algeria tendered for 100,000 MT of Jan milling wheat. Jordan are tendering for 25,000 MT of optional origin hard wheat. Strong crude oil prices lent some support to already firm rapeseed values, although soybeans and palm oil were a bit lower. The Black Sea region is experiencing it's first serious cold spell of the winter, which may cause some shipping and transport disruptions. Ukraine seaports shipped out 639.2 TMT of grains last week, up from 550.9 TMT the previous week. That included 188.3 TMT of wheat, 429.9 TMT of corn and 17 TMT of barley. The top homes were Egypt, India and Tunisia. 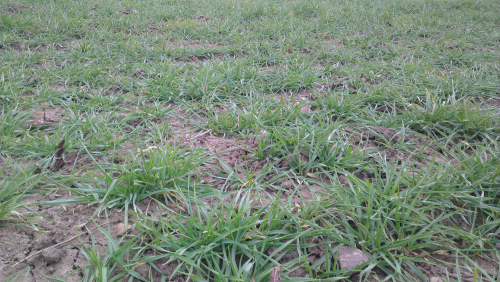 In Ukraine winter grain emergence is seen at 93%. of which 83% is said to be in good to satisfactory condition and 17% weak/thinned. Russia's 2016 harvest is placed at 97.1% done on 45.9 million ha for a crop of 125.5 MMT so far. That includes a corn harvest that's 87.87% done at 14.9 MMT. 09/12/16 -- Beans closed higher despite a USDA report that pegged 2016/17 US soybean ending stocks unchanged at 480 million bushels versus the 474 million expected. World carryout showed an increase from 81.3 MMT to 82.9 MMT. They USDA put Brazil at 102 MMT and left Argentina at 57.0 MMT. They also announced the sale of 132,000 MT of US soybeans to unknown destinations overnight. Jan 17 Soybeans settled at $10.37 1/2, up 10 1/2 cents; Mar 17 Soybeans settled at $10.48 1/2, up 10 3/4 cents; Dec 16 Soybean Meal settled at $317.40, up $5.00; Dec 16 Soybean Oil settled at 36.74, down 31 points. Corn: Corn closed closed higher as the USDA report came and went with hardly a blink. They left 2016/17 US ending stocks unchanged at 2.403 billion bushels. They raised world production by more than 9 MMT to almost 1040 MMT. Brazil was up 3 MMT, China up 3.5 MMT and Russia was raised by 1 MMT. World exports were raised 2 MMT to 141.7 MMT, with Brazil up 1 MMT to 22 MMT and Russia up 600,000 MT to 5.3 MMT. Taiwan were said to have bought 65 TMT of probably US corn overnight. Israel bought 95 TMT of Black Sea corn for Feb/April shipment. The Argentine corn crop is said to be 48% planted. Dec 16 Corn settled at $3.52 1/2, up 6 cents; Mar 17 Corn settled at $3.59 1/2, up 6 cents. Wheat: The wheat market closed with net gains on all three exchanges. The USDA left projected US wheat ending stocks unaltered at 1.143 billion bushels. They raised global and Australian production in 2016/17 to new records. Russian production was seen unchanged at 72 MMT, exports were lowered 1.0 MMT to 29.0 MMT due to slower-than-expected trade. World carryout was seen at an alt-time high of over 252 MMT. SovEcon boosted their estimate for Russia's total grain harvest by 1.5 MMT to 114 MMT. Argentine wheat is said to be 40.7% harvested. US winter wheat weather is starting to raise a few eyebrows with lows below zero over the next 7-10 days with accompanying gale force winds. Dec 16 CBOT Wheat settled at $4.00 1/4, up 9 1/2 cents; Dec 16 KCBT Wheat settled at $3.95 1/2, up 8 1/2 cents; Dec 16 MGEX Wheat settled at $5.36, up 1/4 cent. 09/12/16 -- EU grains closed mostly mixed as the trade digested the latest raft of world supply and demand numbers from the USDA. At the close Jan 17 London wheat was down GBP0.90/tonne at GBP134.90/tonne, Dec 16 Paris wheat was EUR0.50/tonne lower at EUR161.75/tonne, Jan 17 Paris corn was EUR0.25/tonne firmer at EUR164.50/tonne and Feb 17 Paris rapeseed was up EUR2.75/tonne to EUR412.00/tonne. The USDA raised global and Australian production in 2016/17 to new records. Global trade was however also boosted to a new record with stronger import demand from Asia and Brazil. Larger exports for Australia and Argentina were partially offset by a decrease for Russia. EU 2016/17 wheat production was raised 400,000 MT to just shy of 144 MMT and EU exports were left unchanged at 25 MMT (down 28% from 34.7 MMT last season). Australia's crop saw a big hike, up from 28.3 MMT to 33 MMT, with exports also seen sharply higher a 23 MMT from 20.5 MMT previously. The bottom line was a raise in world ending stocks of almost 3 MMT to a record of over 252 MMT. 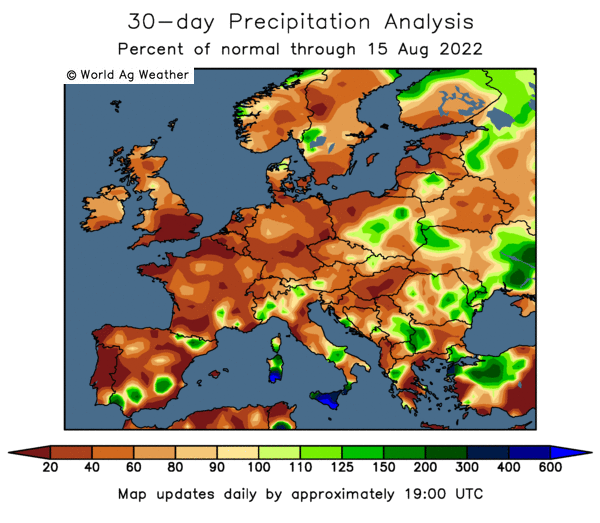 In other news, Brussels announced that they'd only approved a paltry 88 TMT worth of soft wheat exports this past week, down 79% on the previous week. That takes the season to date total to 10.47 MMT. Less than 35 TMT worth of barley exports were passed, taking this season's total to 1.76 MMT. Trade talk suggests that India could be a large wheat importer for the remainder of the season. They're said to have already imported 1.72 MMT of wheat this year, with over 1 MMT of that coming from Ukraine, approximately 500 TMT from Australia and around 150 TMT from France. Trade ideas are that they will need to import at least 3 MMT, and possibly as much as 5 MMT in total, due to quality and quantity shortfalls in their own 2016 crop. Around 400 TMT of Ukraine wheat is rumoured to be held up on passage to India as exporters there concentrate their efforts on corn shipments. 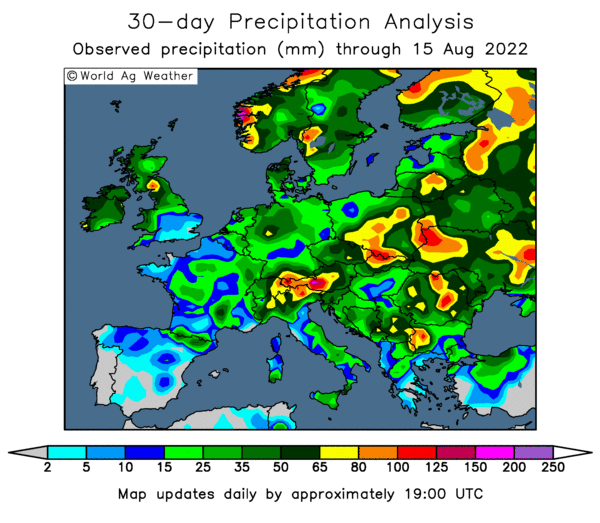 That could provide a short-term window of opportunity for EU wheat.